Average pasture cover (APC) continued to increase this week with a delay in stepping over paddocks for conservation. 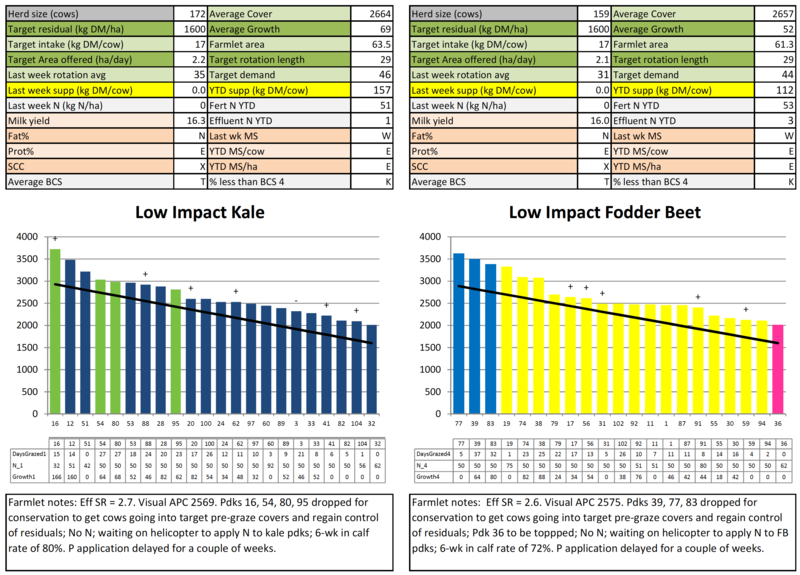 With pre-graze covers being well above target on the LI Kale, LI FB and Std FB farmlets and cows having to go back into paddocks for up to 12 extra hours to achieve target residuals we have been more aggressive in taking out paddocks for conservation this week. 1x runout short rotation paddock in the Std Kale farmlet has been sprayed out for regrassing. It will be allowed to die off completely before surface working and reseeding with perennial ryegrass and white clover. Direct drilling was considered, however this paddock was used to run cows on and off during transitioning to crop in winter 2017 and sustained mild pugging damage. The capital fertiliser applications described last week have been delayed for a couple of weeks to allow all the N to be applied first. Initially the N for the Std farmlets was going to be included with the capital fertiliser. However, with 4 different capital rates and no N required on the LI farmlets it became too much of a logistical challenge to complete everything together. The risk of the wrong product being applied to a paddock was deemed too high so the decision was made to separate the N and capital fertiliser applications. 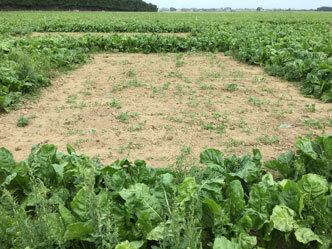 Kale paddocks appear to have recovered from the setback they received following the spray to control the redshank. Nitrogen (as N protect) has been ordered for the crop paddocks as described last week – this was recommended on by our reps a fortnight ago and its hoped the delay won’t have a large impact on yields, weather conditions have delayed the helicopter but it’s meant to be here within the next few days. 2 paddocks on the support block are due to be sprayed out for regrassing. The original intention was to re-grass this block through the winter cropping programme however on further inspection of the pasture composition it was agreed that we need to increase the rate of regrassing. The old pastures on this block are impacting the quality of feed being offered to our R1’s and as the R2’s are being grazed off this block we can’t use them as a tool within the system to tidy up longer feed. So, any extra re-grassing we can do on top of new grass after winter crops will help. These paddocks will be fully cultivated and sown out in a short rotation tetraploid cultivar from PGGWrightson Seeds called Delish with a white clover. This is meant to last 4-5 years and provide good quality feed. With the heat across the region on Tues, Wed and Thu and noticing the cows congregating around the water trough we did regular checks on all herds to make sure they didn’t run out of water. X6 calves on the milking platform are consuming approximate 2 kg pellets/day (half a bag). One of these calves is showing signs of photosensitisation and will have the affected areas treated with zinc. X46 lighter calves at the support block have been receiving 1.6 kg/day but this has been increased to 2.2 kg/calf/day today. 1x poor conditioned mixed age cow has come back negative for Johnes. 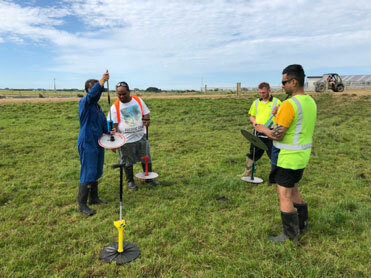 Upskilling of the farm team in the use of the rising plate meter was undertaken on farm this week. 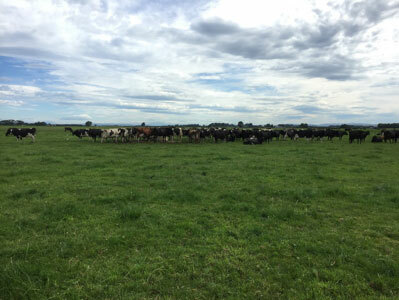 To achieve more consistent feeding levels and residuals across the 4 farms every paddock will be plated by the farm team when the cows come out from their last grazing. To ensure consistency of data collection we are aiming to get all staff on farm (farm and research) regularly calibrating their plating technique and visual assessments against each other. 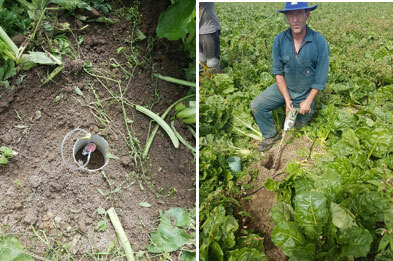 Farm team working on the finer details of using a rising plate meter. Baleage core samples have been collected from about 75% of the baleage batches (individual paddocks from each farm) and sent for analysis, with the remainder scheduled for completion once we have finalised the bale storage plan for lactating and winter bales for each farmlet. Baleage made on a farmlet can only be fed back to cows in that farm system. AgResearch had 2 big days on farm this week installing 348 ceramic cups in their measurement plots for winter 2019. 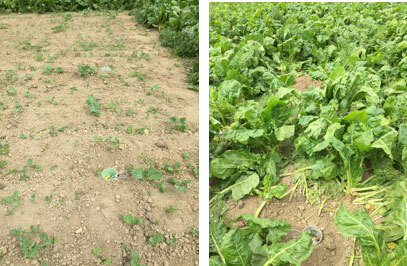 LIFB Paddock 52 has 48 plots of winter crop planted within the trial area to allow measurements of N leaching to be determined from fodder beet and kale treatments on the same soil type. 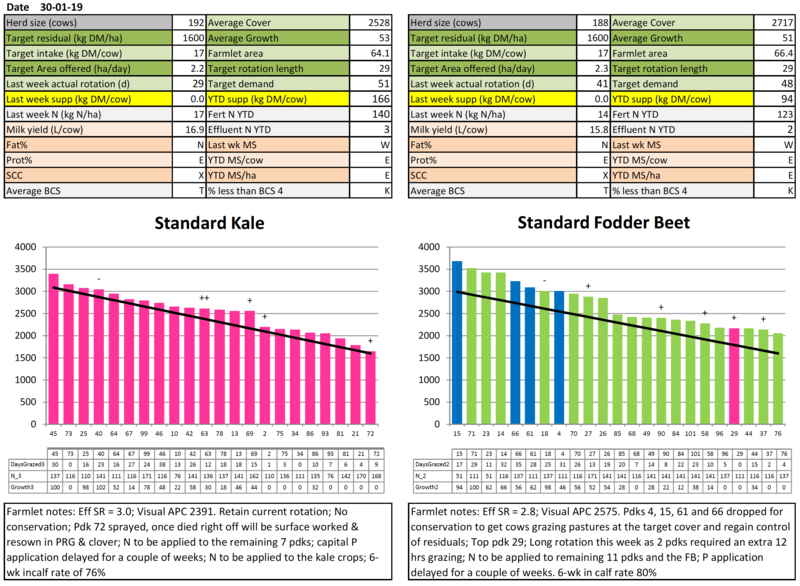 Following the FB being established in the paddock the kale plots were identified, the FB plants removed and kale hand sown. Growth on these kale plots is significantly behind the full kale paddocks on the farm. Cows from one kale herd will be used to graze the kale plots, in a single grazing during the winter grazing period, to ensure the urine being deposited on the soil represents a full kale grazing system.